I think it’s fair to say that the fine wine investment market is taking a while to get to grips with Vega Sicilia Unico. This estate from the Ribera del Duero in northern Spain has been producing wines since the 1860s, and most will agree that they are standing the test of time. At Amphora for the last year or so we have been trumpeting the value of the 2004, a superb 97-pointer whose score matches the 1970 and the 1995, in fact, since the aforementioned 1962, only the 1998 has a better score, at 98 points. As to their stage of drinking lifetime, the 1970 and the 1995 are still designated as “early”. These beauties run and run. Who can resist the tang of marmalade and bacon fat? As you can see from the fine wine investment chart below, the Vega 2002 and the 2003 woke up with a bit of a start recently. Respectively their scores are 95 and 94 points, both inferior to the 97 of 2004. The vintage scores of 2002, 2003 and 2004 respectively are 78, 88 and 95. By any measure, the 2004 is ludicrously cheap, by using directly comparable data. If 1 + 1 doesn’t make 2, then you are on to something. Consider, in addition, that there are seven cases of the 2002 in the market at £1,950, and when they have gone, the next quote is £2,570. As for the 2003, which tends to trade in three-bottle cases, there is one in the market at £470, then the next availability is above £530, or over £2,100 for 12. So it could be suggested to buy the 2004 as a fine wine investment! 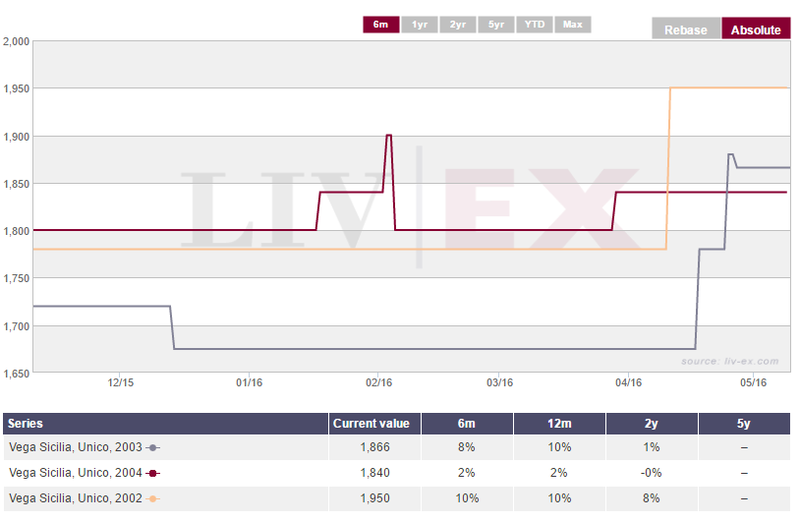 Alongside Dominus, Opus One and Penfold’s Grange, all of which we have been talking about in recent weeks, this Vega (along with Taylor’s Port, unusually), comprise the Liv-ex Rest of the World sub-index, a sub-index that has outperformed all the others in the Liv-ex 1000 over the last five years. This outperformance has obviously attracted investor attention, which can only lead to an expansion of interest in this sector. There aren’t many investable wines in Spain, but it wouldn’t be fair of us not to highlight another which sits along the banks of the Ribera del Duero, in the delightfully named town of Quintanilla de Onesimo. “Onesimo” seems an appropriate moniker for the location of a cult wine! We refer, of course, to the Dominio de Pingus. Pingus first hit the scene in 1995 and although Robert Parker, for one, was euphoric when he first tasted it, the scores really took off around the turn of the millennium when the vineyard went biodynamic. It earned its first maximum in 2004, followed by another in 2012, and since 2000 the lowest score has been 94, in 2003. As to its ability to age, the only vintage so far designated as “mature” is the 2001, all the others being “early” or “young”. Like all cult fine wine investments, production is tiny, amounting to a mere 500 cases, leading to almost immediate scarcity. Investors will be encouraged to learn that pricing is perfectly coherent, with the 98 pointers coming in just below £6,000 per case of 12, the 99 coming in at around £6,300, and the slightly lower scorers around the £5,000 mark. Meanwhile, the two perfect 100 point scorers show some variation, with the 2004 costing £8,800 and the 2012 coming in at nearer £12,000. Before you charge out and buy the 2004 on that basis though, remember that the secondary investment market for cult wines can be somewhat fickle. At Amphora, we only recommend cult wines like Pingus for collectors, for whom the investment return is a secondary consideration or fine wine investors with much larger portfolios. If a portfolio size is less than, say, £50,000, the cost of a cult wine is going to negatively affect the risk profile because, effectively, too high a percentage of the overall value will be vested in a single constituent. Remember though that this fine wine investment risk can be mitigated by buying a 3 or 6-bottle case, but if you take this route, please ensure that you are purchasing wines in OWC or banded format so that the overall condition and provenance can be more easily established. If you’re looking to invest in fine wines, then you can book in for a consultation with Amphora so that we can discuss your investment ambitions and the timescales you’re working towards. Contact our expert team today to start your fine wine investment journey.